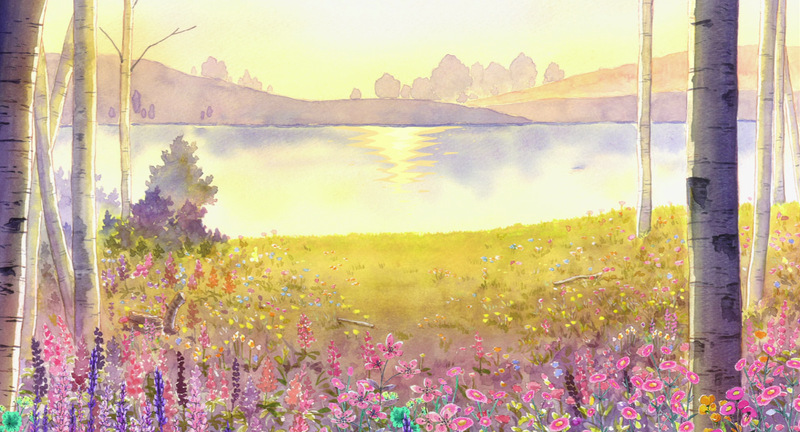 The movie opens with a page from the storybook that frames the rising sun over a lake with birch trees and flowers. The most prominent flowers are lupin or lupine on the left side and round pink flowers with yellow centers on the right. Lupine flowers are said to represent happiness and imagination. The round flowers could be a variety of flowers, but they most resemble pink cosmos which mean a deep lasting love, cleanliness, or in Japanese hanakotoba, a maiden’s heart. Our first shot of Liz is framed by more lupines, holly, and a lily of the valley flower. While lily of the valley is perhaps most known for being poisonous, it carries similar meanings of a white lily like purity, chastity, and sweetness. 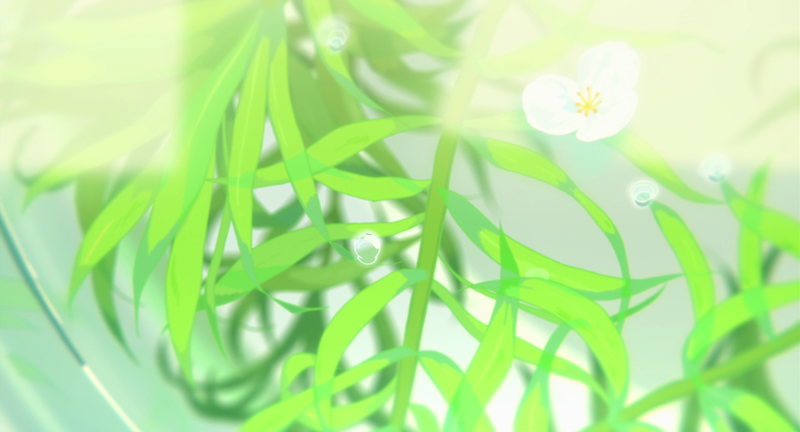 There’s a story that one is incomplete without the person to whom they give a lily of the valley flower. Holly berries have a slightly more humorous meaning, signaling that they’re single and looking. At this point, Liz is alone outside of her animal friends, but the flowers showcase the depth that her feelings could have if given a chance. 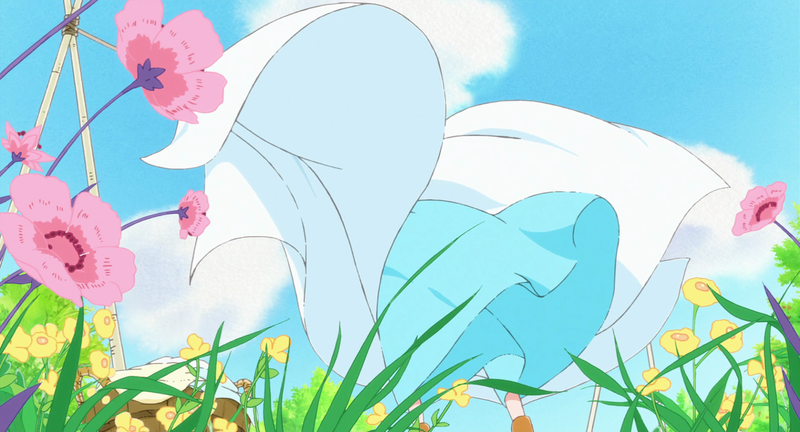 Liz sees the blue bird and after it flies away, the movie pans down to a flowerscape that prominently features blue flowers with yellow centers. The most obvious flower that would tie in here would be a forget-me-not, but these flowers aren’t as small or clustered. They more resemble nemophila (although the centers don’t match) or a blue anemone (despite the centers not being a darker color. Forget-me-nots carry a message of true love but also remembrance, nemophila forgiveness, and blue anemones remembrance and well-wishes for the future or protection. All of these flowers coincide with the blue bird’s first appearance, signifying its importance. The plot twist of Liz and the Blue Bird, if you can call it that, is that childhood friends Mizore Yoroizuka and Nozomi Kasaki assume that their storybook counterparts to their relationship are Liz and the blue bird respectively when the reverse is true. This is showcased through the music of the movie — which is a series of posts in and of itself — and also the usage of flower language among other symbols like the blue bird’s feather. 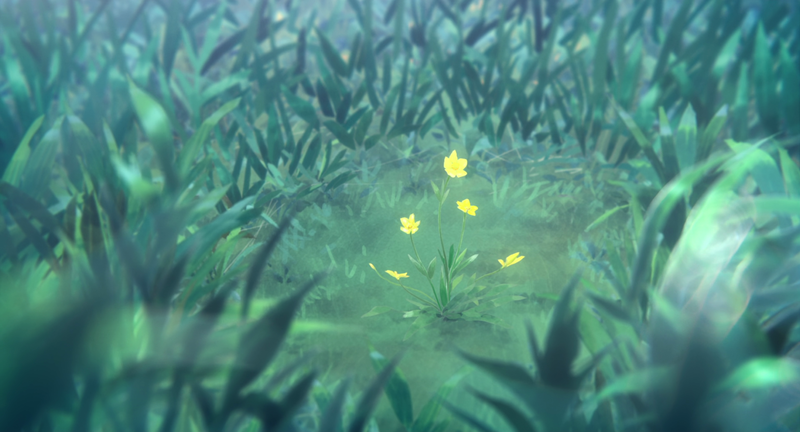 Buttercups appear briefly as a standalone shot when Nozomi crosses the school gate as Mizore waits for her on the steps. Buttercups can mean a cheery happiness or childlike charm, but can also represent childishness and ingratitude. Much goes unsaid between Nozomi and Mizore throughout the film and this meaning could apply to both of them. 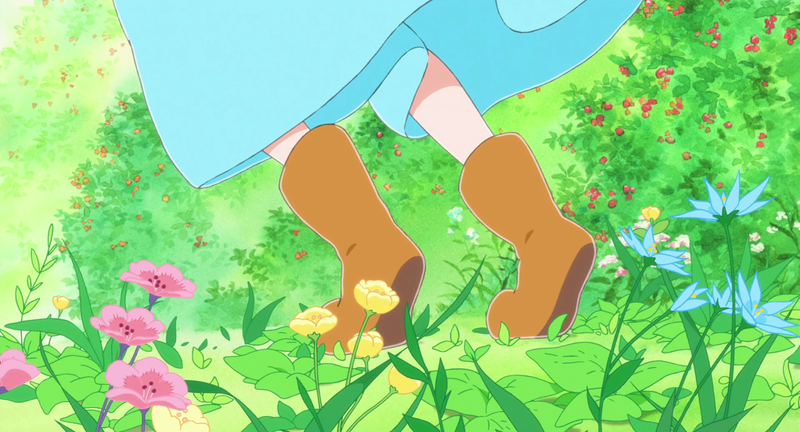 Initially, the buttercups only seem to apply to Nozomi, who is more outwardly capricious, and the framing sets us up to think this is the case. 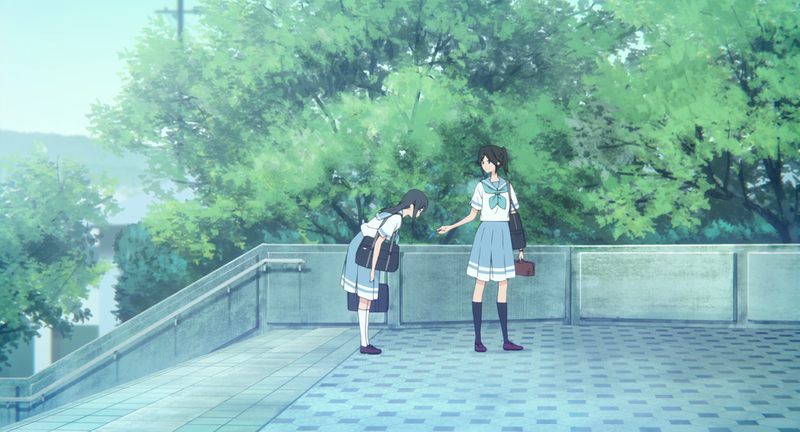 Similarly, the feather of the blue bird appears to be bestowed upon Mizore by Nozomi, but once all is revealed, this entire scene can be viewed as Nozomi returning the feather to its rightful owner, Mizore. 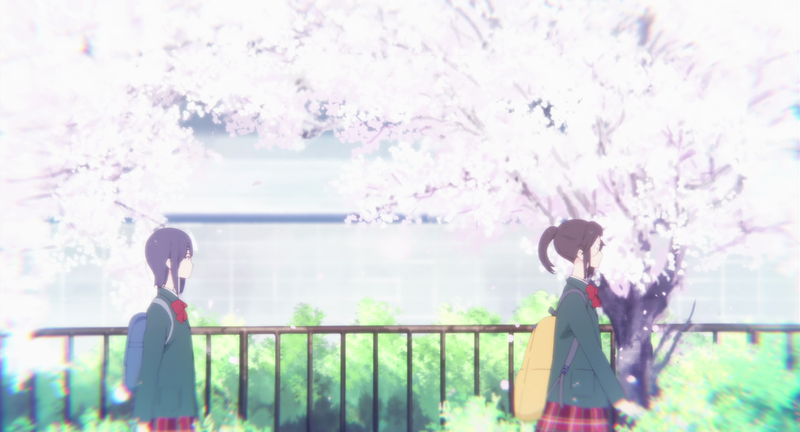 As Mizore follows the energetic Nozomi up the stairs, she recalls following Nozomi as an elementary school student walking under falling cherry blossoms. 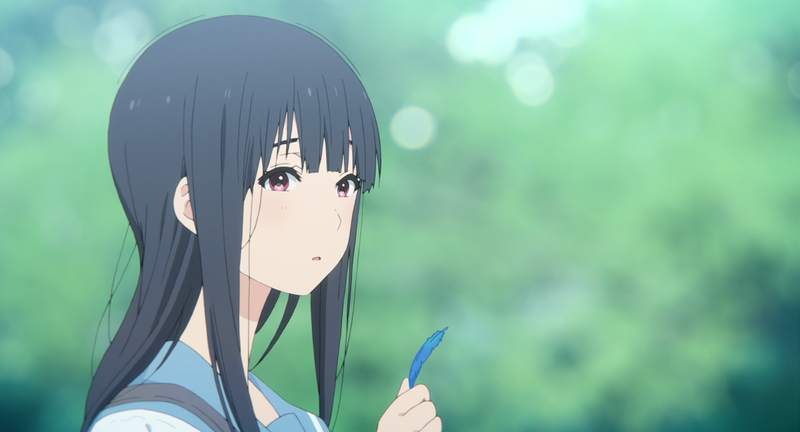 Liz and the Blue Bird is the story that reflects, like many of Yamada’s projects, on the transient nature of relationships. Much of the miscommunication comes from the fact that Mizore doesn’t understand why Liz would have to let the blue bird go. Cherry blossoms are a repeating motif in Japanese media as a whole, representing impermanence. Mizore and Nozomi’s relationship is a deep emotional connection, but it’s also fleeting. The positioning of this flashback reiterates Mizore and Nozomi’s existing dynamic while also telling us that the nature of their relationship is about to change because it too is transient. 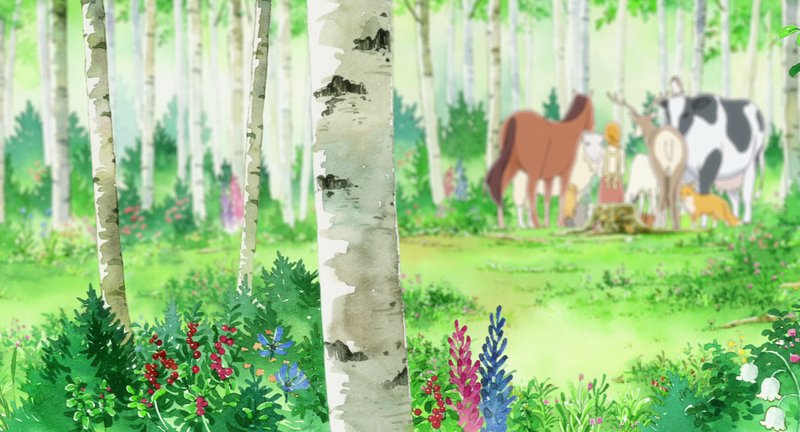 Most of the flowers in Liz and the Blue Bird appear in the titular storybook. These illustrations frequently return to the same flowers at Liz’s home, but recontextualize them through her relationship with the blue bird. 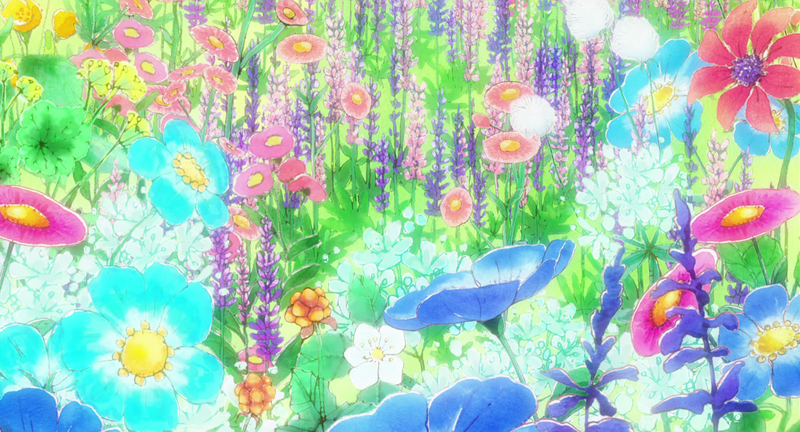 Here we see what appear to be buttercups (which were also shown in Mizore and Nozomi’s opening scene) as well as what appear to be pink anemones. Pink anemones carry a different meaning than their blue counterparts and can have the negative connotation of a forsaken or dying love. These also appear at the blue bird’s feet alongside blue flowers with pointed petals that most resemble a blue star flower although could be something else. Blue star flowers are said to show faithfulness and affection. Despite the fact that pink anemones may have a gloomier meaning, a possible indication of how Liz eventually shows her love by telling the blue bird to return to the skies, the blue stars are a reminder that there is genuine affection and a steadfast nature to their relationship. Even if it ends, their feelings are valid. 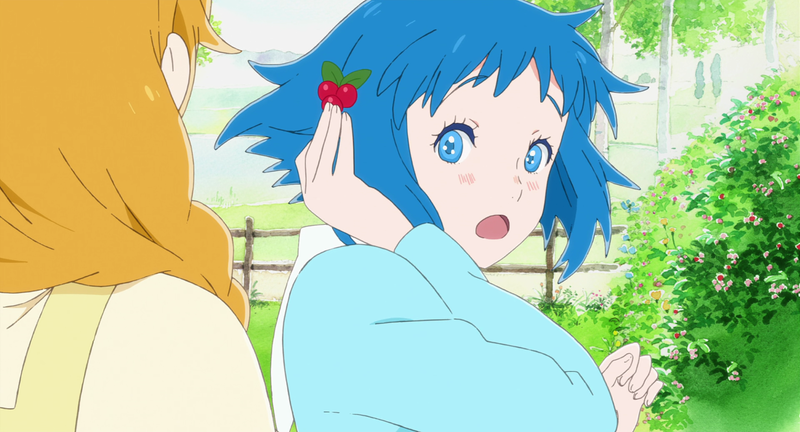 There’s also a cute scene where Liz pins what look like holly berries in the blue bird’s hair. As previously mentioned, they can carry the meaning of single and looking, so this is a bit of a cute flower language joke. 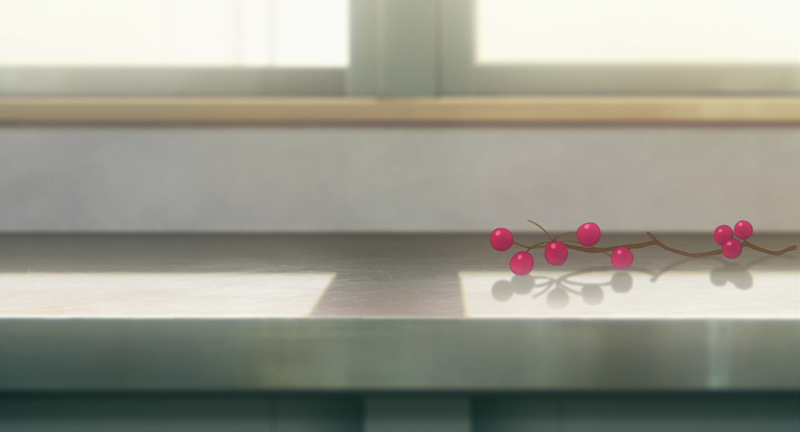 A lingering shot at a small branch of berries accompanies this conversation that Mizore has with her teacher. It marks the moment that Mizore realizes that she’s not Liz, but the blue bird — her immense musical talent makes this the case and is the equivalent of the blue bird’s wings. The reason why Mizore didn’t understand why Liz gave up the blue bird was because she was thinking of her as Liz who didn’t want to give up Nozomi, the blue bird. 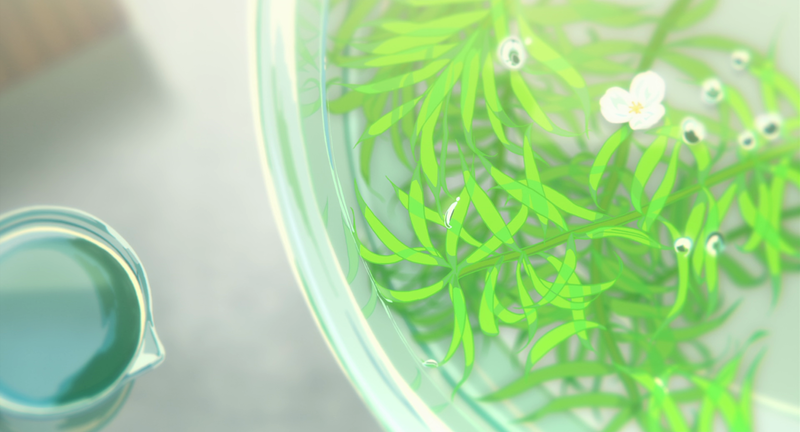 The holly branch visually ties Mizore to the blue bird making the connection as Mizore and Nozomi think things through separately. As they both come to the realization that Mizore is the blue bird and Nozomi is Liz, a small, white, three-petaled flower appears. There are few flowers with three petals and this most resembles a spiderwort. Spiderworts are said to mean that you hold someone in high regard and admire them. This is particularly important for Mizore and Nozomi, especially Nozomi, who just realized that she has unwittingly held Mizore back. Naoko Yamada doesn’t use flowers in the same way that she uses them to express almost all of the unspoken emotion in A Silent Voice. Instead, she lets the music do the talking and uses flowers as a visual through line that accompanies the emotional narrative much like the storybook itself or the image of the blue bird. It’s fitting that Mizore’s goodbye to Nozomi and “flight” is told through the musical piece and not any other way. Here, it’s Nozomi who follows Mizore, unable to reach the same heights. This isn’t a happy ending, nor is it a sad one. Instead, it’s a bittersweet turning point in a relationship that both of them have outgrown in some way. Still, the admiration and affection remains. A point I’d like to consider: You submit that the twist of the movie is that Nozomi is actually Liz and Mizore is actually the Blue Bird. But what if that’s not true? What if both of them are actually both, depending on the perspective they’re viewed from? What if the real twist of the movie is that the story isn’t actually as applicable to the two of them as they imagined? I would argue, that the climax of the movie isn’t the goodbye performance, it’s what happens after – Nozomi and Mizore’s conversation in the empty classroom. It’s when Nozomi tries to say she’ll act out her part and not hold Mizore back, only for Mizore to interrupt her – for what I’m pretty sure is the only time in the entire movie! – and pointedly say that that Nozomi’s being selfish and not considering what Mizore wants. To be perfectly honest, I don’t really like the idea of Liz as a goodbye story – it doesn’t really pose any adequate reason for Nozomi and Mizore’s relationship to end, simply for it to change form. I’d argue that the visual language and overall structure of the film makes more sense in the latter context – and honestly that the former context is a little poisonous and untrue. I hope this comment didn’t come off as too much of a “well, actually” or anything, I enjoy your work. I just have some complicated feelings about this movie and its overall franchise and thought I’d try to get them out. Your first paragraph is my thought too, which was a genius twist to pull! I don’t think the movie is ambiguous about Mizore being the blue bird. Mizore is the one who can fly. The motif is very clear with the shot of the the blue bird flapping her wings as Mizore displays her immense musical talent. Nozomi just doesn’t have that talent. She can only see Miroze fly away while she stays “on the ground.” Nozomi herself can’t fly. And Mizore can’t reach out to people as effortlessly and breezily as Nozomi can. The whole reason Mizore ever thinks of herself as Liz is because she keeps seeing Nozomi do things Mizore can’t. That doesn’t – and shouldn’t – change just because Mizore’s realized that she also has something she can do that Nozomi can’t. Indeed, Mizore doesn’t actually care that much about the Oboe specifically, she doesn’t see it as something freeing the same way Nozomi does, just as something that allows her to be close to Nozomi. She states this explicitly in the climax of the movie. The whole thrust of that conversation – for both of them – is “all the things about yourself that you think nothing of are irreplacable to me.” Again, this isn’t even really an interpretation, it’s something Mizore herself says outright – while almost literally staring directly into the camera as if to make sure that the audience gets it. Each can fly in a way the other can’t, and each fears that they’re holding the other back. 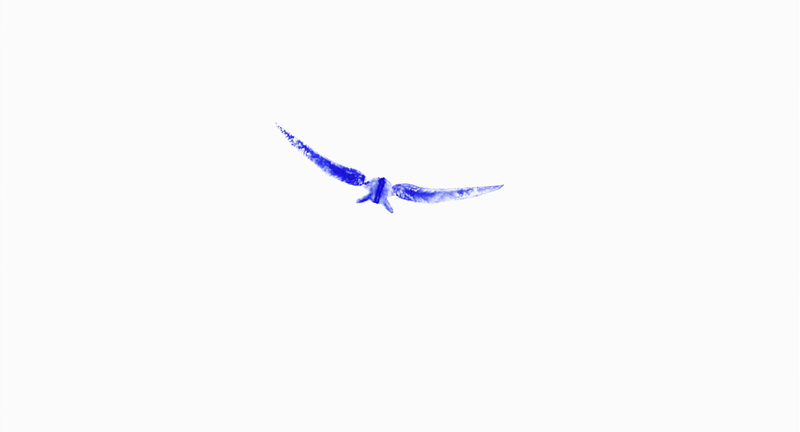 I’d also say that the long shot of two birds flying away together – neither of which, pointedly, is blue – we get immediately after this conversation is *probably* pretty important thematically. I didn’t say that it was a firm parting. Only the storybook Liz and blue bird have a definitive separation. I said it was a bittersweet turning point in their relationship. The reason why I said that the perception of their roles was a “twist” so to speak, is because I perceived the film as initially setting it up as a one-to-one comparison: Mizore as Liz, Nozomi as the blue bird. They perceive this to be true themselves until near the end. One of the major points of the film, in my opinion, is that they’re not confined to their presumed storybook counterparts. It’s not a one-to-one comparison and both they and we as an audience are shown that. It’s actually why the flower language around Liz and the blue bird is a bit more rigid than the real life flowers shown with Mizore and Nozomi that mean affection/admiration/etc. I don’t think that anything you bring up is at odds with what I said in this post. Whichever way the film’s actual intent might be, assuming there even is one specific way it was meant to be taken, I feel like the ending is left pretty open for different interpretations to be valid. Personally, my view on it is similar to musingsandpretensions’. From a character standpoint I agree that the film doesn’t seem to present much of a real need or reason for them to drift apart, and from a thematic standpoint I think it’s a much stronger conclusion for the characters to realize that while they see parallels to themselves in the Liz story and have used it to better understand themselves and each other, they’re not consigned to that same ending just because the story they saw themselves in went that way. I saw the end of the film as the two of them clearing out a lot of misconceptions and unspoken feelings so that they can be more honest and better to each other, rather than as the two of them having a last hurrah before parting. Though I think the article kind of comes to a similar conclusion: it’s a turning point, and what that really means is left up to them (and our imaginations) after the film ends.